After extensive research and experimentation, inventor Carl Nicodemus discovered a phenomenon that allowed him to combine low pressure liquid with vapor, and discharge a high pressure liquid at levels never before attainable through a device with no moving parts. He continued to work on this technology and the "Pressure - Amplifier - Condenser" (PAC or HelioPAC™) was born. The HelioPAC does all this with no moving parts, making it the most efficient, low maintenance, hot water pump system available. The HelioPAC replaces old style (conventional) systems that incorporate high pressure mechanical pumps and sparger, ‘shell and tube’, or plate type heat exchangers. Another unique advantage of the HelioPAC Technology is that during operation, it creates its own internal vacuum. This allows He-Chem™ specially formulated chemical cleaners to be metered in automatically. As the He-Chem Cleaner enters the HelioPAC, it encounters extreme heat and turbulence which thoroughly mixes and disperses it into the pressurized hot water. 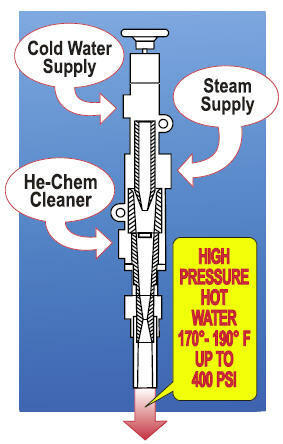 This action creates a powerful cleaning solution. The HelioPAC models featured on this site are constructed with a bronze external housing and stainless steel internal components. Detergent inlet valve assemblies are available in brass or stainless steel.